Club Penguin Cheats by Mimo777 Club Penguin Cheats by Mimo777: Join Club Penguin Elite Penguin Force NOW! I am already part of it is is so AWESOME! Passed it. It's fun! If you unlock the code from the new game you can get a puffle whistle. I called Flare! He can do different tricks! Everybody was like wow where did you get that puffle? Its so awesome! Have fun everyone! mimo, your a memember! cool!! Dude! It is cool but i was already in the epf becasue my ds game (not the new one) had a code in it. btw where is the F.I.S.H? A. A good import website to buy the new game? B. How to get stealth 100%? I love it! I have the EPF suit and Flare the puffle...but I wonder how you get the rest of the puffles and if there is more to go with the suite, how you get them. Since when was Mimo a member? Has anyone besides me noticed how our furniture in our igloos are gone? I just updated mine because I thought it was a glitch, and the next time I went to my igloo, all my furniture was gone! Does this have something to do with Herbert, or is it just a glitch? heyy mimo, i found some of glitches! 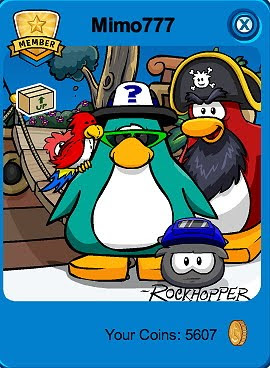 and another question: ive seen a penguin dressed as herbert, but how do i get that outfit? I got the suit when I unlocked the puffle. To unlock them, buy Herbert's Revenge and enter the code it comes with. ok 2 questions: where do u get the suit? and is flare the only elite puffle u can unlock right now? Hey Mimo did you know that all the furniture in everyones igloo has been put in storage! :/ im kinda sad 'cause I worked hard to set mine up! To get stealth 100%, before the 20 seconds are up, throw a snowball at Camera 2 and hide behind one of the pillars. EVERYTHING IN THE YOUR IGGY IS GONE BUT IN THE BOW SOOOOO!!!!! How do u get 100% on the clever/escape part? OMG THAT HAPPENED TO ME TOO!!! Does anyone have an explanation? Also, i fed my puffles, logged off for dinner, came back and they were STARVING!!! Help? p.s. how do u get full stelth on the test? i tried ninja.. no luck. the coolest thing is the puffle! OMG YOUR SUCH A GENEOUS!!! THIS GUY DESERVES A MEDAL OR SOMETHING! Omg i went to my iggy and all my funiture dissapeared! then when i put it all back it dissapeared again! grrrrrr now im getting mad at cp. lol jk................or am i? First of all, when it tells you to go to the blue square, DON'T do it. Either wait, or throw a snowball at the energy generator. how do you enter the code? To get all problem solving, don't go in the cage trap. Just throw a snowball at the power surge. If your talking about why camera two can always see you, what you do is throw a snowball at the lense and it wont see you. Hide behind one of the pillars so camera one doesn't spot you. Good luck! Yea the puffle is awesome! I hope in the future they add all the rest of the elite puffles too. Waddle On! You can join by taking the test in the Everyday Phoning Facility. Click the phone on the wall. I believe it should be ringing. Good luck! If you have the new DS game Herbert's Revenge you can unlock a cool EPF shirt. Waddle On! You can get an EPF shirt by unlocking it with the code from the new DS game Herbert's Revenge. And yes, I believe Flare is the only elite puffle available right now. I believe they will add the rest of the elite puffle crew in the future. You have to go to the Everyday Phoning Facility. Then a screen comes and it says, "Would you like to take the test?". Then you take it! Cool! It is so cool how you can call flare! But it isn't so cool after he uses his welding torch... especially if it burns you! where is the target? what is the target? I think that the Spy phone is the BEST part! I don't know why, but I really like it! I noticed something - they are missing the Phoning place, and they have more stuff on the phone coming! I think they are ADDING more Eliet Puffles! Hey Mimo, does anyone know where the entrance to the room unlocked by the FIRST Clubpenguin DS game is? Thanks for the help. i Passes the test woooo its so awsome! I know! I pretended to be the Director and everyone listened to me! Then I went on my secret account and went BOO! I AM HERBERT! XD Everyone freaked out. You have to have the game. You put in the game and get it! It's so cool! Yeah, it's awesome, and I hope you get the game! AWESOME! im gonna go check it out right now! I don't know where to buy the game other than a store and clubpenguin.com. I think to get 100% stealth you have to hide right under the camera! Yes, I want more puffles! Must... kidnap... puffles... I hope there is more to the suit! Because what there is so far is REALLY cool! Billybob says it is a glitch, but many penguins have assumed that it was Herbert! Everyone has this glitch, and I hope it is fixed soon! Yeah, I like the old HQ... But if you look at the first HQ and now, it is such a big difference! It used to be a closet, now it is an amazing futuristic Command Room! You have to have the game! When you get it, it comes with the suit! All you have to do is click on the phone booth when you go into the old sports shop. Aww... that stinks! Mimo will probably give you a break! Keep on modding (except for tomorrow)! Yes! And you get the gadget, some coins, and the whistle too! That glitch is so weird! Billybob said him and the pplz would work on itz as much as possible! Hmm... well, there is a recruit button on the gadget! Try that! 81 Do you see the face? You just have to pass the test! 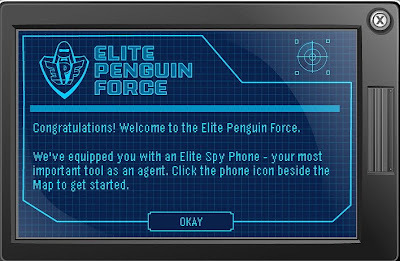 You go to the EPF (everyday phoning facility) and take the test that comes up on the screen! It is so cool! Except for the welding torch.. that is pretty hot! Sorry, that joke was as corny as Herbert's last plan! Oops.. I need to stop with the corny jokes! They're so corny that you get healthier when you read them! AHH!! What is wrong with me?! You have to throw a snowball at camera 2! We have foiled the camera's plan... Muahahaha! Hey mimo right now try clicking to buy something in the sports catalog, 'cause when you do it says that the item is currently unavailable! Funny Glitch! (speed) 2. When it says to run to the red box, don't get mad about it anything less than 15-20 seconds gets you a perfect score. (problem solving)4. And for the final one DON'T GO IN THE CAGE wait until the thing has finished loading then throw the snowball BEFORE YOU GO INTO THE CAGE. Sweetness!I passed the quiz and im an epf agent!Btw is there any other puffles you can unlock with the Herberts Revenge code? Do you need herberts revenge to get the new uniform cuz i see people wearing it were do u get it?? Anonymous said...How do you take the test? Sometimes when I go to the Facility, it says that the room is full! How can the room be full when I'm the only one in there? Hey mimo I got a cheat for you. In the test how you beat the hiding part is hit camera 2 with a snowball and then hide where camera 1 can't see you then you should beat it. Yea, you can unlock an EPF shirt with the code it comes with. I don't think that will be the only EPF outfit though. I think there will be more in the near future. No I don't believe so. I think Flare is the only one out at the moment but I think the others will be added soon. Waddle On! Congrats by the way for passing! the test is easy. all you do is hit the target in the corner, go to the green square then the red, and no matter what you do you will be spotted by a camera on the hiding one. at the end dont go on the blue square. if you do just hit the electric box with a snowball. Tada! You can enter a code by clicking Play Now, then on the top right cornor of the starting page you will see a round spiky thingy that says Unlock Items Online. Click that and type in your penguins name and password. Click I have a code then type it in! If you need more help you can check out the Help and Support section. Good luck! Actually you can escape being spotted by camera two by throwing a snowball at it, then hide behind one of the pillars. Good luck! OWW! Your making my ears beg for merccy! Plz plz dont type in caps. Club Penguin is working on fixing this. TO get full stealth, when the part that tells you to hide somewhere, throw a snowball at camera 2 and hide anywhere. You got to CP, select unlock items online, pick your penguin, and click I have a code. Then type it in! That's probably because we had to repeat so many missions! You mean the one in the test...? That's right next to the screen! I really hope so! Flare is really cool, think of everyone taking a walk with Elite Puffles! They should be able t interact with objects on CP! That's kinda what this whole post is about... =D But good eye! What? Your furniture? I guess that CP has fixed it already! That is the exit! XD I like the teleport, but they don't have an instant HQ button! I failed at it! :P I couldn't figure it out! I know how now, I'm just too lazy to try! No, you can only get Flare... but hopefully later you can get some more! You need HR. It is only one part of it, though. I hope more comes out! I think Mimo knows that. But I couldn't figure it out for a while! I am a fail. You can hit the camera with a snowball to complete it! I kept on walking to the blue square! XD I hope nobody else makes my mistake! I wonder if I'm related to Rookie.... Just kidding! I am too much a fail to be him. Follow Mimo's instructions! Are you a Secret Agent? If so, click on your spy phone and a message will appear. Follow Mimo's or their instructions, and you'll become an EPF agent! But it's only for members. If you aren't a normal Secret Agent yet, you should become one! The missions are so fun. Nice! Unfortunately, for me there would be no point in buying the Herbert's Revenge game because I don't have a Nintendo DS... :( I really want one, though, dangit! LOL! And that puffle is SO COOL! Heck yea!!! It is really cool isn't it? Hi mimo I have 1 question. When you unlock the elite puffle do you like get to pick which one you want or do you have all of them? Epic and Awesome Are Insults For This! There is no Word to Describe It! Do you get to pick which elite puffle you get or not? Actually Bobhead he meant the big tube thing in the middle and there is an instant HQ button. 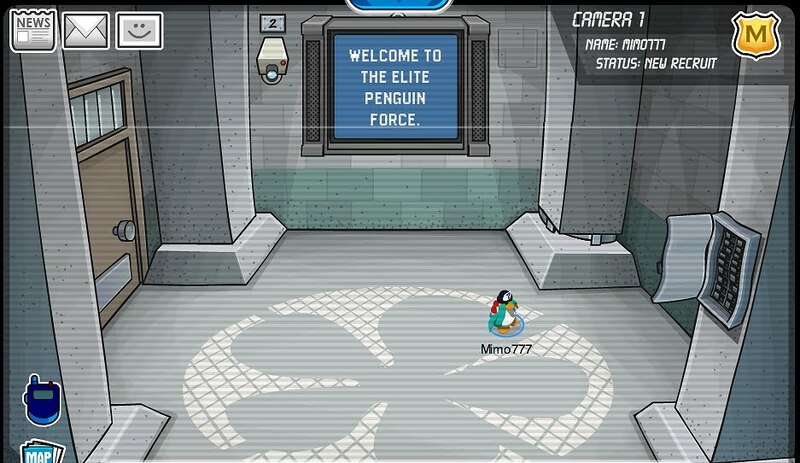 Click the EPF sign thing on the bottom middle and you teleport to HQ. Well, right now you can only pick Flare but I think you will be able to pick the rest of the elite puffles in the future. Waddle On! No. Flare is the only elite puffle you can get right now but I think the rest of the elite puffles will be added in the future. Waddle On! I Am Done With My Exam! Now I got 1 On The 28th Of June, JOY! Mimo! Check onz the membership page! It says the Adventure Party is returning! And don't forget about the new igloo music! Plz gimme credit! Heres what you do. You have to throw a snowball at camera two and then hide behind one of the pillars so camera one doesn't spot you. Good luck! He used to not be! I bet he got a membership so he could access the member rooms! Actually they do Bobhead. It's located at the bottom of the phone. Click the gold EPF badge and you can telleport to the command room. Give it a try. Is it A, B, C... oh, D! None of the above! It just automatically gives you Flare only! Epic and awesome are insults? Those are DEATH WISHES for it! There isn't even a word to insult this! where is the f.i.s.h cataloge? 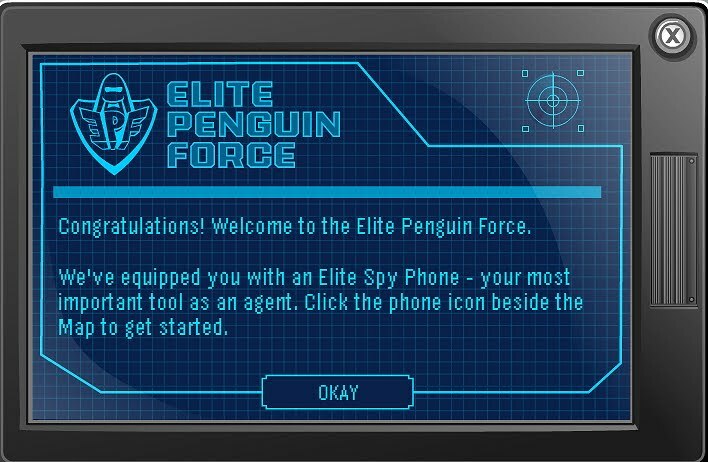 Theres a new page on cp if you are on the page before selecting ur penguin click on "Join EPF Now" And you will be at the new cp page that tells you how to become a EPF agent and everything! its so cool. I am already finished mine! I am out of school! JOY! Coolio! Good job finding that! How do we get perfect score in stealth? Oh! I didn't see that! I am a bad looker! Thx! You have to throw a snowball at the camera then hide behind a pillar! you go to everyday phoning facility (ex sport shop) or click 'go there' on a postcard. when you get in, click on the phone when it rings. You can take the test without being a member, you just have to be sent an invite. very truee scamper, and anyway the elevator doubles as an entrance when youre in the phoning facility, but what i dont get is the physics of it. now, we walk in and go DOWN to the epf command room wheres before we stayed on the same level - whats with that? have they relocated down or something? To get a perfect score in stealth you have to throw a snowball at camera two so it doesn't see you then stop, drop, and waddle behind one of the pillars so camera one doesn't spot you. Good luck! I have been hit by the ways of Safa153.... now I realize how fun modding is! I think to get the EPF clothes, you must type in the code from Club Penguin Herbert's Revenge. I think you also get the clothes. where did you get the EPF thingy, the certificate, I finished and I can not find it! OMG thanks thanks thanks!!!! But then i have another question sorry not to metion it on the first btw where is the code!!!! I know the answer to B. Hide from camera 1 behind a pillar and throw a snowball to cover camera 2. Wow, They really outdid themselves THIS time! Thanks for throwing us free players a bone! is the only puffle you can get flare? I took the test so many times. It's so much fun! I got a perfect score on one! Hey! Your welcome. For your next quesion. You can get a code from Club Penguin toys sold in stores like Walmart, Target, or Toys R Us. You probably want a Herbert's Revenge code that unlocks an EPF shirt and Flare the puffle right? Herbert's Revenge is a DS game you can buy and you get the code inside. You can buy it at the same locations. Walmart, Target, and Gamestop. Good luck! You get the certificate from using the code that comes with the first Club Penguin DS game. Not the Herbert's Revenge DS game. And you don't get it from the test. I hope you get the first game. Waddle On! Ok heres how you get a perfect score: 1, hit the target. you dont have to hit it in the middle, just hit it. 2. Next, run from the green square to the red square under 8 minutes.3. Then, hit camera 2 with a snowball and hide in the middile of the post with electrical box thingy. Camera 1 nor camera two can see you. 4.dont go to the blue square!!! throw a snowball at the electrical power box thingy!!! you pass with a PERFECT SCORE!!! hope this helped! I just got herberts revenge this morning and already beat it cuz the missions are just like the cp ones it was still fun tho! P.S. flare is so awsome i wonder if soon we get the rest of the elite puffles and the rest of the uniform. Omg!! Congratulations to Hnwjanuary11 for that cool riddle you sent in to Club Penguin Times!! You rock! All of MY furniture is still there even after I'm an EPF agent! Why is this happening to others but not me? Oh and for 100% Stealth, throw a snowball at camera 2 and hide behind those vertical pillars/columns. If you become an EPF you can still do the older missions. The mission log is still at the bottom right cornor just like it should be. Good luck finishing the last mission! Waddle On! man. i liked EPF when only a few penguins were there. :( Also, I told my dad i wont need herbert's revenge but now I DO! first you hit the lenses with a snowball. after that you hide in front of of one of the tall things where you can't see yourself at all. ummmm if you are a non-member do you still get a puffle? where are the F.I.S.H. and the spy clothes? ?